Laser hair treatment is the newest and most advanced techniques of non-surgical hair growth. In this low level lasers are used to stimulate the hair follicles. It increases the blood flow to the scalp hence increase nutrient supply to the hair follicles. Laser treatment is effective for both men and women. Some hair transplant surgeons have observed that laser hair treatment can improve the results of hair transplant by speedy postoperative wound healing, rapid growth of hair and a quicker resolution of postoperative telogen effluvium (“shock loss” of hair follicles). Laser treatment has also shown to increase the hair density over the vertex area and prevent further hair fall over the frontal areas of scalp. Low level laser treatment when combined with 5% minoxidil provided more noticeable cosmetic benefits for women especially where they are not prescribed finasteride. 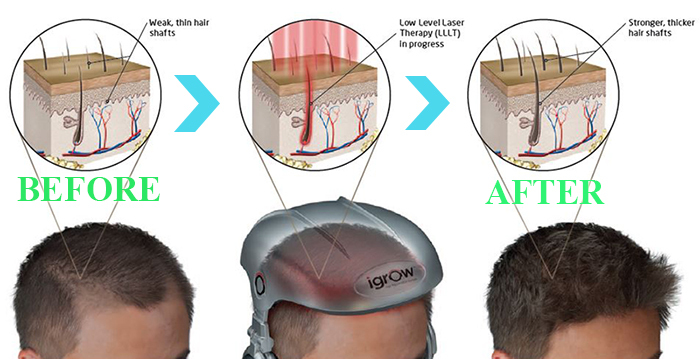 When laser light treatment is used over the scalp it increases the blood flow to the hair follicles. The wavelength of light used in Low-Level Laser Light Treatment (650-670 nm) also stimulates the mitochondria of the cells of hair follicles. This in turn increases their metabolism which had earlier slowed down due to various reasons. Increased metabolism coupled with increased blood supply means increased synthesis of component of hair like keratin and increased turnover of the cells of hair follicle. Lasers have been said to improve overall quality of hair, promote hair growth and increase hair shaft diameter. It acts on cytochrome C oxidase leading to production of adenosine triphosphate (ATP) which is converted to cyclic AMP in the hair follicle cells, releasing energy and stimulating metabolic processes necessary for hair growth. Laser treatment devices have a similar appearance to a helmet which is placed over the top of head. 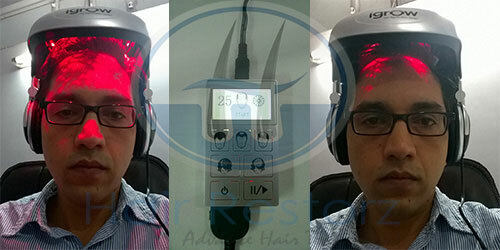 The low level laser rotates allowing laser rays which are red in colour, to enter into the scalp. These new era devices are light weight and easy to use. They also have provision for listening to your favourite music while you are undergoing the treatment. Some of these products are FDA Approved and are proven to be safe and effective. Hair loss is classified in men according to the Norwood-Hamilton Classification and in women according to the Ludwig-Savin Scale. Low level laser treatment is more effective in males who have Norwood Hamilton Classifications of IIa to V and in females who have Ludwig-Savin scale I-4, II-1, II-2, or frontal patterns of hair loss and have Fitzpatrick skin types I to IV. Laser treatment should not be used in patients who are on medications or products that are photosensitising.